NO REFUNDS, RETURNS OR EXCHANGES AND THIS PRODUCT IS NONTRASFERABLE. 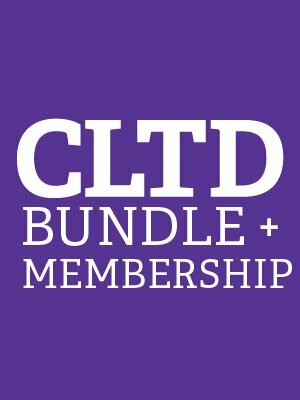 The CLTD Bundle + membership is only available for individuals who are NOT already an APICS member. If you are a PLUS member, please purchase the CLTD Bundle only product. If you are a CORE member, you will need to contact customer service to upgrade to a Plus membership to purchase the CLTD Bundle. If purchased separately, the Learning System, exam and 2nd Chance Exam would total, $2,120 ? that’s a savings of $700! The CLTD Learning System includes print and eDownload courseware with online access for one year from the date of purchase. It is a comprehensive professional development and exam preparation program that consists of eight modules across four books with approximately 950 pages of content and web-based study tools that reflect the entire CLTD Exam Content Manual (ECM). View full details of the Learning System at learn.apics.org/CLTD. *The CLTD exam purchased with this bundle will be provided to you as an exam credit/voucher. You will have 6 months from the time you purchase your CLTD bundle to redeem your exam credit/voucher towards the purchase of your CLTD Authorization to Test (ATT). Once you purchase your exam ATT, you will have 6 months from the time of purchase to schedule and take your exam. **You will ONLY qualify for the 2nd Chance Exam (retake) when you schedule and take your first examwithin 90 days of purchasing your valid Authorization to Test and fail your exam. Your 2nd Chance Exam (retake), if issued, will be valid for 6 months.